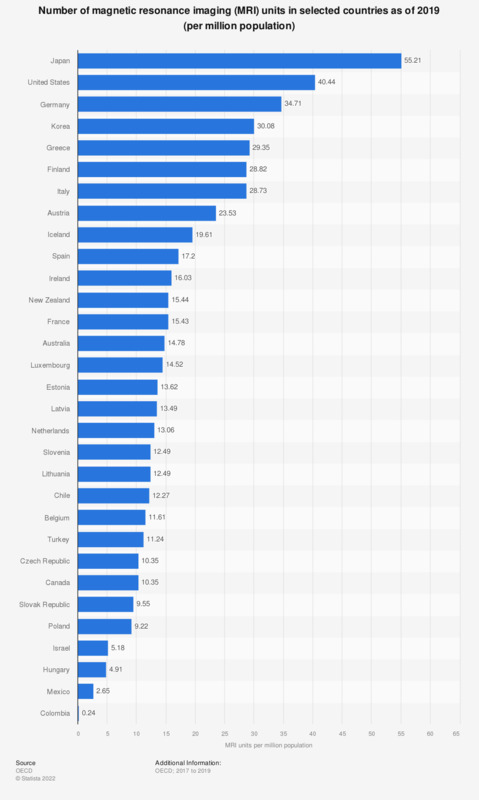 Among member countries of the Organization of Economic Co-operation and Development (OECD), the United States have one of the highest densities of magnetic resonance imaging (MRI) units. Nearly 38 such units are available per every million of its population. Germany and South Korea follow with rates of some 34 and 29 per one million of its inhabitants. Compared to these countries, Israel has around five and Hungary four MRI units per every million. The density of diagnostic imaging units can be one measurement to define the quality of a country’s health care infrastructure. The invention of MRI scanners revolutionized diagnostic imaging as it doesn’t use radiation, but a magnetic field and radio waves. Since ionized radiation as used in CT-scans and X-rays is potentially harmful for the patient, this includes a significant advantage for MRIs. MRI scans are principally used for imaging organs, soft tissues, ligaments, and other parts of the body which are difficult to see. While on the other hand, computer tomography (CT) scanners are more frequently used to show bony structures. Among the global top manufacturers of MRI scanners are General Electric, Siemens, Hitachi, and Philips. A single scan per MRI could cost up to 4,000 U.S. dollars, and thus double the cost of a scan with CT. The purchase of an MRI scanner could be a major investment for a practice or a hospital, with prices ranging from 150 thousand dollars up to several million dollars. Of course, there are installation and maintenance costs to be taken into account as well. With nearly 40 million MRI scans performed annually in the United States, it’s clear that diagnostic imaging costs are substantial. Data are for 2017 or latest year available.